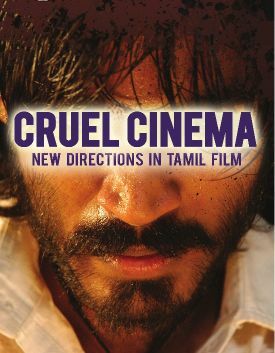 This weekend marks the beginning of a new film series from 3rd I Films that will tour in certain cities across the U.S. Cruel Cinema: New Directions in Tamil Film opens today at the Pacific Film Archive in Berkeley, California (1/30-2/19), and will “travel on to the Freer and Sackler Galleries in Washington, DC and BAMcinematek in Brooklyn, NY among other venues” according to 3rd I. The series provides an introduction to four new wave Tamil films from the latter half of the 2000s. The program notes (quoted below) by Lalitha Gopalan and Anuj Vaidya definitely piqued my interest, and so did clips from the featured films, sometimes because and sometimes in spite of the cruelty portrayed. If you caught the wave earlier and saw any of these films, what did you think? 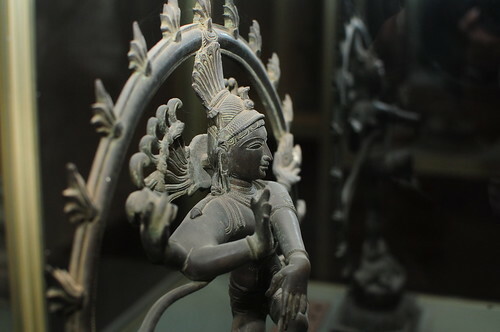 The Government Museum in Chennai has an amazing collection of bronzes from around what is present day Tamil Nadu. Here are some photos from my visit there last month. Click on any of them for a larger version on Flickr. Despite the sad condition of the displays – dust-covered and poorly lit – the wonder and detail of the craft and work is still easily visible. 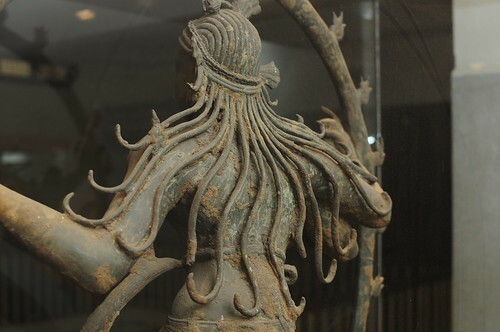 The hair of other Natarajas I’ve seen until now have resembled the one above: a ring attached to the back of the head out of which locks of hair emerge. 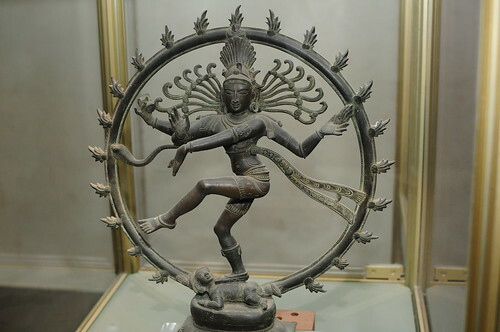 This next one, however (my favorite of the lot), has hair that is very much part of Siva’s head. 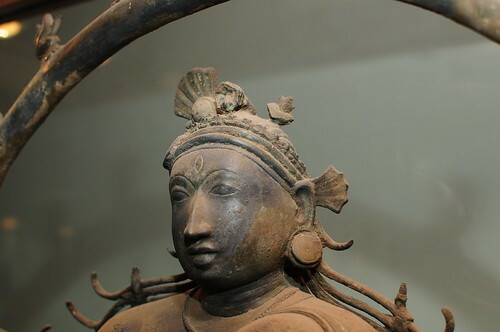 It’s from Melaperamballam in Thanjavur, circa 10th Century AD. Posted on January 24, 2011 by V.V. Something Aseem Chhabra said this weekend made me think of this. Several months ago, I was detained at the Michigan-Canadian border because I had loose, unlabeled spices from Toronto, which the Lords of U.S. Customs did not recognize and needed to submit to agricultural inspection, a request I did not consider unreasonable until I saw how it was to be done. We were removed from our vehicle and did not have even visual contact with our property while they searched it. (Who will inspect the inspection? They could take something! I said. As far I could tell, the only person of color in the office where we waited was Barack Obama. I found his picture on the wall comforting. Our vehicle when we returned to it looked ransacked, but to the best of our knowledge, they took (and planted) nothing. Still, I have learned to prefer the airport. Or the New York border, where my loose Sri Lankan spices flummox no one. That’s right brown boys and girls…for the first time in months– and for the first time ever in the mitten state of MICHIGAN, Sepia Mutiny will host a meetup! This weekend, I will be speaking at the SAAN conference which is going down at Abhi’s alma mater, the University of Maize and Blue; since our Sugi lives in Ann Arbor, it seemed apposite to host a raging party while I’m there, and by raging party we mean eating Masala Dosa, Idli and Vada until we have to be rolled, still ghee-covered and burping happily, out of a restaurant. 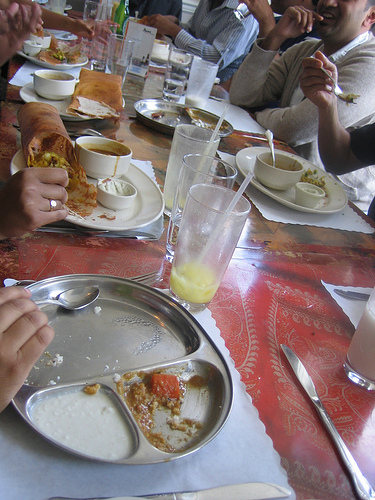 I’m still not over the loss of my beloved Amma Vegetarian in Georgetown– side eye to the person who closed it– and worse than that, it’s been ages since I had a nice dosa. The thought of proper Southie food makes me giddy, so when I think of how I’ll get to nom some of that AND squeal at Sugi AND potentially meet some of our loyal Midwestern readers, lurkers and trolls…well, I feel faint from such excitement. Remember: all are welcome at meetups. Even if you’ve never commented before, feel free to stop by– Sugi and I would love to meet you! I’ve heard great things about Madras Masala; not only is the food supposed to be good (It’s auntie-tested, uncle-approved), it’s well-located, which is helpful since neither Sugi nor I have cars. 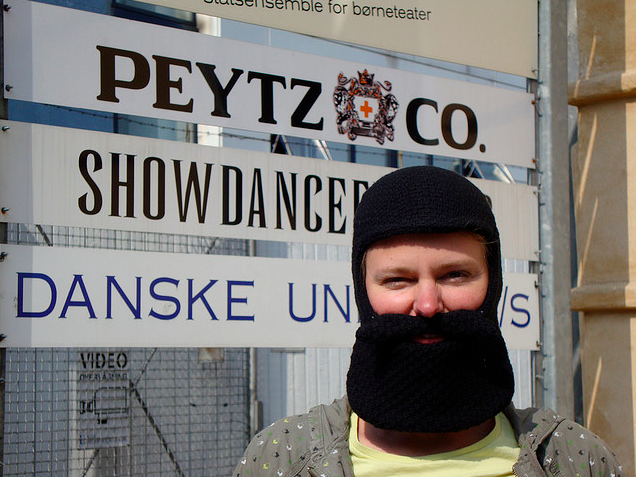 Let’s meet there at 6pm on Saturday– which is after the SAAN conference. I’ve been warned that they may not have enough space, so if you could let us know in the comments if you’re going to join us, that would be a great help. I don’t know about you, but I’m really pumped about 2011. There are so many things which sucked about 2010, I commenced this year wanting, nay, NEEDING change. Like millions of others, I made resolutions– in fact, I probably made more of those than I ever have, before. But they are secondary to gut feelings, intentions and the power of inspiration. Instead of resolving to work out every day until my body looks like it did when I played indoor soccer four days a week, I’m looking at my friend GD who beasts through frigid weather to run, no matter what (and he eats cleanly, too!). Let me make this hyper-relevant to the SM crew. It’s no secret that despite my ancient history with mutineer Vinod (KIDDING! You all wish! ), Ennis is probably my favorite mutineer, evar. 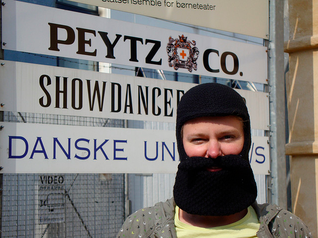 I’m not talking about his blogging skills though– I’m lucky enough to know him in real life, as a good friend. Ennis is thoughtful, patient and occasionally funny enough that I laugh until I cry. Point is, he can be hilarious. He can also be sweet and kind, the best, most loyal, encouraging sort of friend, the person who texts you reassurance and silliness one day and a quiet, virtual hug the next, when it’s your Dad’s death anniversary. So why am I making Ennis blush right now? Believe it or not, I have a point! I have figured out the power behind Ennis’ awesomeness. You’re going to love this epiphany. 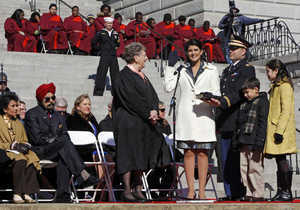 Governor Nikki Haley’s inauguration last Wednesday felt like a glimmer of light in a political landscape darkened by the recent tragic mass shooting in Tucson, Arizona. Republicans, Tea Party supporters, Mama Grizzlies, crack-the-fiscal-whip types, Haley’s family, friends and community–all these people and others had reasons to feel happy on the occasion of her inauguration. But what made my day was seeing the young girls who braved the freezing weather in Columbia to see the first-ever inauguration of a woman and minority governor in the history of South Carolina, a history that spans at least four centuries. We’ve posted about this so many times at SM and the sad tips and pleas for help keep coming– and that means we haven’t done enough, as a people. 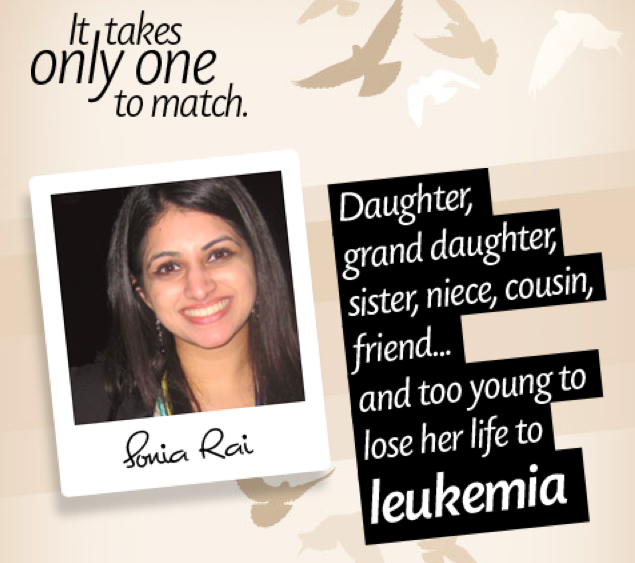 There aren’t enough Desis in the national bone marrow registry and because of that sad reality, when my Uncle or your favorite college prankster is diagnosed with a life-stealing ailment, the amount of hope they are given by someone in a white coat is tiny. Without other Desis in the system, the chances for a match grown narrower and narrower; I know at one point, a non-trivial number of our readers were getting swabbed for Vinay. Thank you for that. You are still in the system. Since then, new people have joined the Sepia Mutiny community and it is my flickering, idealistic hope that one of you is a match for Sonia. When we lived in Chennai in 2008-09, my partner-in-crime and I bemoaned the lack of public space in the city to just hang out. It seemed that there were the beaches and a few small parks scattered throughout the city, but no public space with grass, lots of trees, and shade. 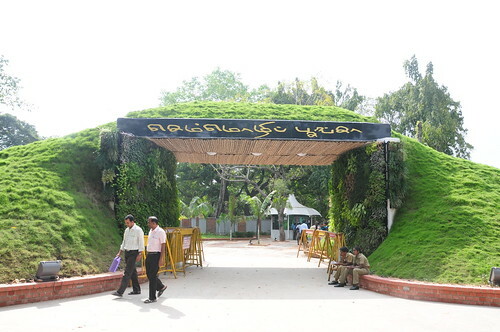 Enter the Semmozhi Poonga, opened to the public in late November, 2010. I visited on December 29 for a cost of Rs. 5, and was pleasantly surprised to find a park with well-maintained and sittable grass, lots of trees and shade, playground equipment for kids, and benches occupied by young lovers.